This month marked a historic first for the trans* community. March boasted the inaugural National Month of Action for Transgender Healthcare, a campaign co-sponsored by groups as diverse as Pride at Work, the Transgender Law Center, Basic Rights Oregon and the National Center for Transgender Equality. 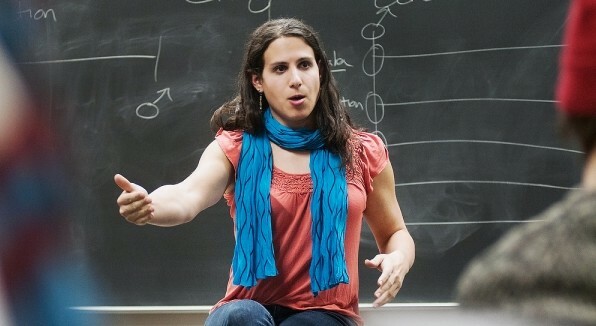 Our first “Trans* Month of Action” has seen events in San Francisco, Oregon and now Chicago, as trans* community organizer Rebecca Kling has worked with Erica Mott, Paul Escriva, Dion Walton and Hale Thompson to bring conversations on LGBT community health to the University of Illinois at Chicago. However, Kling was lucky. When she was in the hospital, Rebcca Kling&apos;s mother stayed with her “all day and night” out of fear for her safety. Her mother remembered Rebecca telling her a story about a woman on the East Coast that medics refused to treat when they saw that she was trans*. She died on the side of the road. Her mother couldn&apos;t to let the same thing happen to her. Kling detailed her own struggles with her gender reassignment surgery (or “Vagification,” as she very cleverly puts it) and getting her medical insurance to cover the costs. “My insurance has a specific exclusion for gender reassignment surgery, and I’m trying to fight that because it’s discriminatory,” Kling said. Kling explained trasition doesn’t come cheap. For trans* women, there are a litany of options, including hormones, hair removal, trach shaves and reassignment surgery, all of which cost money. Similarly for trans* men, there’s breast removal, hysterectomy and hormones. According to Kling, “even the most inclusive coverage often only covers hormones and assignment surgery. That leaves out a lot." A major focal point of the Open Forum’s discussion will be the Affordable Care Act, which, in its essence, bans medical discrimination against LGBT people. Commenting on an anecdote from Mara Kiesling of the National Center for Transgender Equality, whose friend was denied treatment for anemia because of her “transsexual blood,” The Nation writes,“The Affordable Care Act will end many of these absurd exclusions. In 2014, the Patient’s Bill of Rights will prevent insurance companies from denying coverage based on pre-existing conditions. What’s more, the ACA will bring Title VII federal nondiscrimination protections to the health care field." However, Kling said that the bill’s implementation and purview is far from perfect. It doesn’t include gender reassignment surgery. As part of the national conversation on health care, the queer community is too seldom included in the discourse, and Kling hopes that dialogues like the Trans* Month of Action and the Open Forum will help change that. “We need to open this conversation up further, because no one person has the same health care needs as any other,” Kling said. Monday’s forum will include panelists such as Jen Richards of We Happy Trans, Alexis Martinez of the Trans Oral History Project, Channyn Park of the Chicago House and Trans Life Project and Dr. Margo Bell of Stroger Hospital. For Kling, the most exciting part is the variety of perspectives being offered. Although she feels one panel could never be reflective of the breadth of the community, the forum has solicited questions from attendees to further include a diversity of experiences. Many respondents have come up with topics she wouldn’t have thought of. Kling says she’s most excited to see the energy behind the forum. 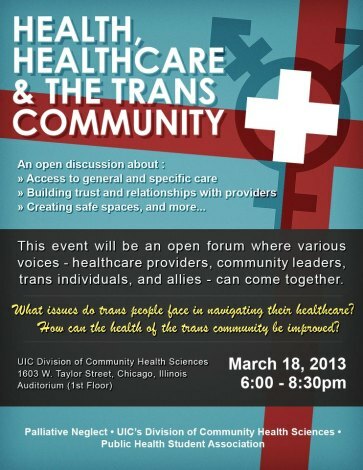 The Open Forum on Transgender Health, Healthcare and the Trans* Community will take place at UIC’s Division of Community Health Sciences at 1603 W. Taylor Street on March 18 from 6 to 8:30 p.m. The event will be held in the first floor auditorium and is free and open to the public. More information can be obtained on their Facebook page or by emailing Rebecca Kling at rebecca@rebeccakling.com.